While in Hong Kong we did a full-day tour of the islands and stumbled across this smoke-filled monastery. From the image above it is hard to see past the numerous hanging incense cones and the grimy cinderblock walls covered in soot from incense. However, deep in the shadows of the altar the gilt furniture and dark woods accentuate the room's connection to a higher power. I was told that some of the cones of incense can burn for two weeks. 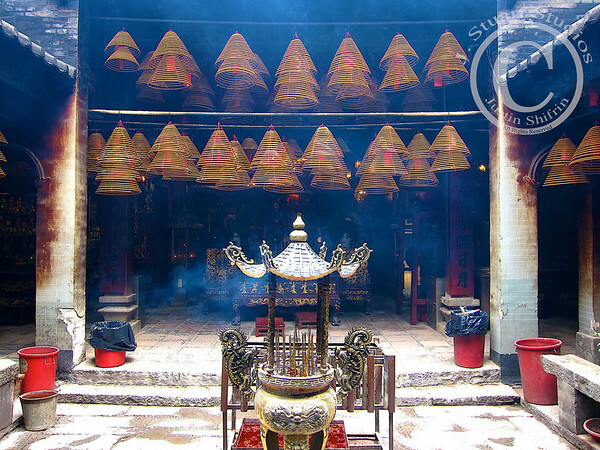 If you look closely you might be able to find red prayers hanging within the incense.